Photo: NCSY Dallas NCSY held a police appreciation program. Teens gave homemade candy apples to policemen and policewomen. Mazal tov to Steve Waldman, the Dallas Holocaust Museum/Center for Education and Tolerance’s chairman of the board of directors, who has been awarded the Dallas Business Journal’s 2015 Outstanding Directors Award. The award recognizes directors, boards and committees that demonstrate skill and leadership in guiding companies to success. Other honorees of the prestigious award this year include former Dallas Mayor Ron Kirk and Mike Boone, chairman of the board of trustees of Southern Methodist University. Honorees were chosen by an expert panel of independent judges, industry insiders and authorities on board governance. All winners were honored in the Journal’s Sept. 18 weekly edition and at a celebratory awards dinner Sept. 17 at the Ritz-Carlton in Dallas. Steve has been on the board of the Museum for 11 years. Although his life is full as a husband, father, active volunteer and chief executive officer of the thriving Waldman Bros insurance brokerage, he took on the equivalent of a second full-time job two years ago when he became the board chair of the Dallas Holocaust Museum. Mary Pat Higgins, the Museum’s president and CEO, said she is not surprised by this recognition. Steve attends and serves as emcee for a majority of Museum functions — from academic lectures to fundraising dinners — and personally prepares his topical and insightful remarks. Now in the midst of a robust capital campaign to build a new facility, the Museum calls on Stephen to attend countless fundraising appointments with new donors, board meetings and strategic planning sessions. He lends his business background and expertise to all facets of Museum operations. Waldman Bros is deeply rooted in the local community, with leadership and staff members actively donating time and resources through board membership for a number of nonprofits. Waldman Bros participates in more than 40 charity events yearly through sponsorships, donations and volunteer participation. Some of these events include the Jewish Federation of Greater Dallas’ Annual Men’s Event, the Dallas area Multiple Sclerosis Walk, Congregation Shearith Israel’s Annual Golf Tournament, Women to Woman luncheon supporting Jewish Family Service and Waldman Bros’ 27th annual Erwin Waldman Memorial Golf Tournament hosted by the Jewish Community Center of Dallas. 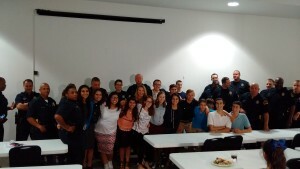 On Wednesday night, Sept, 9, Dallas NCSY (National Conference of Synagogue Youth) held a “Police Appreciation” program. Teens gave homemade candy apples to the policemen and policewomen at the police station on McCallum Boulevard and Hillcrest, and wished them a sweet New Year. They also provided a pizza dinner to the grateful staff. Sergeant Karl Kemper addressed the teens and took questions, as did Senior Corporal Dara Couch. Rabbi Gershon Meisel, regional director of Southwest NCSY, flew in from Houston for the event, which was also featured on Fox 4 News as part of a segment on attacks on police officers and law enforcement supporters. The teens wished the policemen and policewomen a heartfelt Shana Tova and warm feelings were reciprocated. Congregation Anshai Torah is building a bridge as the new year begins and 5776 will find area millennials crossing that bridge — or gesher — as, at 7:30 p.m., Oct. 1, at a barbecue in an off-site sukkah, CAT’s Gesher program gets underway for a myriad of events and programs. Targeted toward young adults, between the ages of 22 and 35, it will provide a networking group that is so much more. Membership in CAT is not required to join in at the Gesher programming, which will include Shabbat dinners (after CAT Kabbalat Shabbat services). “We hope anyone in our community who might feel a connection to Anshai Torah will be here,” said Rabbi Michael Kushnick, who is directing the program. Program highlights include the Oct. 1 evening in the sukkah, a Nov. 20 Shabbat dinner following services, the Jan. 29 Arnie Sweet Scholar-in-Residence featuring IKAR’s Rabbi Sharon Brous at Congregation Anshai Torah and a March 23 Purim party. The group will also enjoy Havdallah and Top Golf, a lake party and other holiday events. To RSVP (required), or for event location and other information, call 972-473-7718 or email Rabbi.kushnick@anshaitorah.org. Shearith Israel will host a Lunch ‘n’ Learn in the sukkah Thursday, Oct. 1. The gathering is open to the public and offers a fascinating program. Join the Texas Jewish Arts Association and Congregation Shearith Israel for a conversation about elevating the mitzvah of building and dwelling in a sukkah to an art form. Join others as they gather in Shearith’s sukkah, learn about basic rules for sukkah construction, and identify opportunities to insert creativity into the process, using pieces from Sukkah City as examples. Cost for the delicious lunch is $10.